As I’ve shared before, I love teaching, introducing and exploring math concepts with math literature. Some of my favorite books are the “Sir Cumference” books by Cindy Neuschwander. 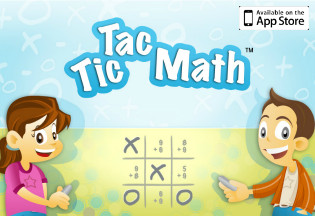 They are full of humor and wit, all while exploring important math topics in a way that is fun and engaging. 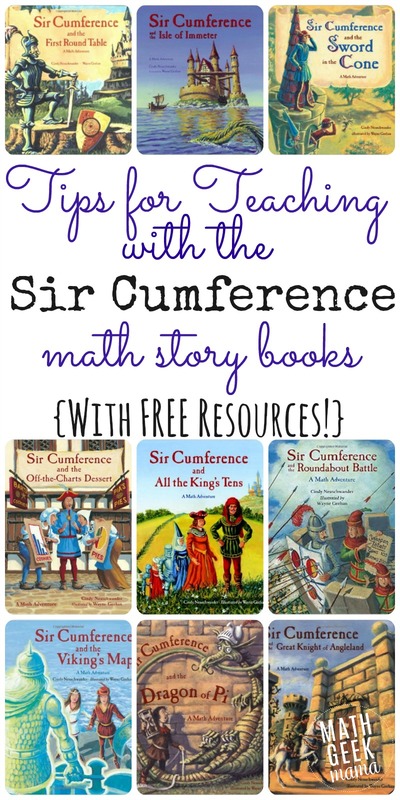 Today I want to share some tips for teaching math with Sir Cumference, as well as free resources to extend the learning! 1. Read through the story once first. Before you try to stop and discuss or explore further, read it all the way through. Take time to simply enjoy the story and let kids get an idea of what ideas are presented. 2. Read it again, asking questions. When you read through it again, go more slowly. Allow kids to make observations or ask questions of their own. Point out the math discovered in the story, and ask them to solve the math problems. 3. Use the explanations at the end of the story. Most of the Sir Cumference stories have further explanation of the math involved at the end of the book. Use this to have further discussions or ask more probing questions. 4. 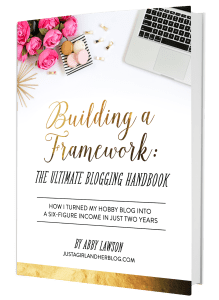 Combine books to cover related topics. Some of the Sir Cumference stories would work well being used together. For instance, Sir Cumference and All the King’s Tens would work well with Sir Cumference and the Roundabout Battle, as place value plays an important role in rounding and building number sense. Likewise, several of the books cover important geometry concepts and could be used together to teach a geometry unit. For example, Sir Cumference and the Dragon of Pi could be used along with Sir Cumference and the Isle of Immeter to teach area and perimeter, along with circumference and the derivation of the number pi. 5. Use them to introduce a new concept. If you are introducing kids to something for the very first time, exploring the concepts through reading is a great way to show kids the concept in context and introduce it gently so that it’s not so overwhelming. Sir Cumference and the Viking’s Map, for instance, is a fun way to introduce graphing and give kids an idea of what it is and how it can be used, rather than simply showing them how to plot points. Likewise, Sir Cumference and the Off-the-Charts Dessert is a great way to introduce various kinds of charts and graphs in a way that is fun and engaging for kids. 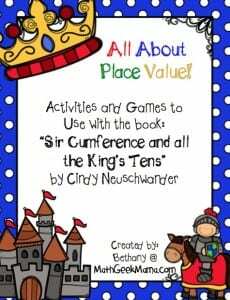 Click here to go to my shop to download All About Place Value with Sir Cumference and All the King’s Tens. 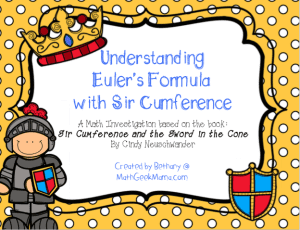 Click here to go to my shop to download 3D Shapes and Euler’s formula with Sir Cumference and the Sword in the Cone. 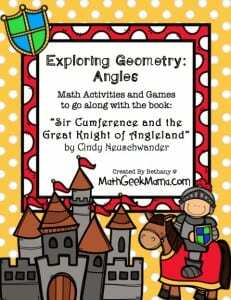 Click here to go to my shop to download and learn about measuring angles with Sir Cumference and the Great Knight of Angleland. 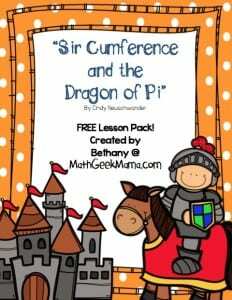 Click here to go to my shop to download and learn about circumference and diameter with Sir Cumference and the Dragon of Pi. And if you would like all of these lessons and more, they are part of my huge “Sir Cumference” lesson bundle! This set includes lessons and games to use with the entire collection of “Sir Cumference” books, as well as skills practice pages, teaching tips and answer keys. What do you think? Do you and your kids enjoy the Sir Cumference books? Which one is your favorite? 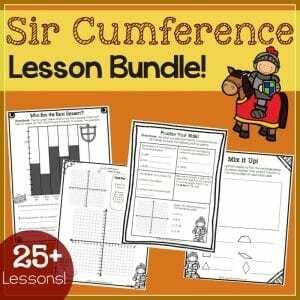 What tips would you add for teaching math with Sir Cumference? What ages or grades would you say these books are best for? I’ve never heard them before and I have one who learns best through reading so I’m excited to hear about these! Thanks so much! I would say they are best for grades 2-4 (or ages 8-10), but they can definitely be read and adapted for younger kids, or used with older kids as well. The books focused on geometry topics would especially be good to use with older kids in the middle grades. 🙂 You should be able to get most of them at the library, so definitely check them out! I recall hearing about these books long ago. Thanks for the info! I will be getting some of these as soon as I can! I think my kids will enjoy them.. This is such an awesome book series! I’ve had my eye on them for a while, and checked them out at the library, but I’d love to own them. What a wonderful selection of resources to go with these books. We’ve read a few of them and they are just so fun. Love using literature with math! I am looking for the free resources for your book the Isle of Immeter. and could not find it on your site. Can you help me find it. Thanks so much! These books were a hit with my 6th graders! We even made paper hats and crowns to wear while we read them and worked on our Favorite No problems! Yay!! I would love to have the entire set of books. 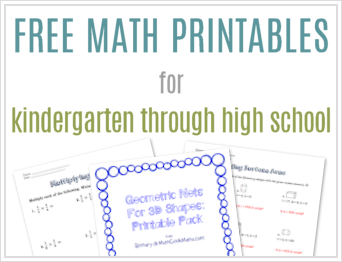 I am about to start back teaching high school math after being a stay at home mom for about 6 years!